Bonmarche Holdings BON which had seen trading become significantly weaker than expected sine the beginning of March, has rejected a takeover bid from Phillip Day’s Spectre Holdings, on the basis that it undervalues the business and its future prospects. These included a rise in the underlying loss for the year from a possible £4.0m. to between £5.0m. and £6.0m. 2 April, Mr Day, who owns Edinburgh Woollen Mill Group, acquired 26 million Bonmarché shares at 11.445p a share, which brought his stake up to 52.4% and a warning that he expected a “material reduction” in staff. The Bonmarche Board was left with nothing but the expression of a wish to hold discussions, which would be for the benefit of all shareholders, including no doubt, themselves. So far they appear to be unable to find a reason why shareholders would benefit from their continued presence in the governance of the company, especially having regard to its recent continued decline under their stewardship. Games Workshop Group GAW has today declared a dividend of 35 pence per share, in line with the Company’s policy of distributing truly surplus cash and to be paid on 31 May.This takes the total dividend declared and paid during the year ending 2 June 2019 to £1.55 per share. Trading has continued well since the half year report in January with sales and profits ahead of last year. The Board’s current expectations are that profit before tax for the year to June 2019 will be c. £80 million. Plus 500 Ltd PLUS updates that financial markets in the three months to the end of March were extremely subdued and revenue.fell by 65%. New customers were down by 10%. The company that It is impossible to predict market conditions for the rest of the year and conclusions can not be drawn about the full year outcome based on the Group’s first quarter performance. Mobile Streams plc MOS has had to undergo a comprehensive cost-cutting exercise, in fact so comprehensive that both Non-Executive Directors have had to volunteer a deferral of 50% of their respective remuneration. Sizable one-off redundancy and severance payments have had to be made, to employees, many of whom were of long service. With falling revenue, decisive steps became necessary to allow the company to preserve and protect its remaining cash balances. National Express NEX has acquired a 60% stake in WeDriveU an employee shuttle company serving many of the world’s largest and fastest growing companies in Silicon Valley and other fast growing US cities.. The deal also includes an Option to acquire the remaining shares in tranches over the next three years. Volex plc VLX Half year results to the 30th September showed a solid performance with organic growth of 48% in underlying operating profit. This is all due to a rejuvenated management team with a clear strategy opines the Executive Chairman. With a continuing strong sales pipeline, the Board expects full year trading performance will be slightly ahead of market expectations. 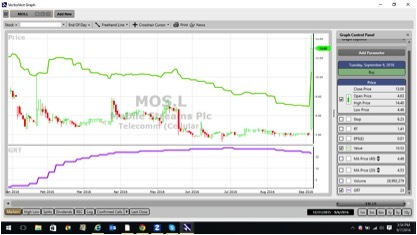 Mobile Streams plc MOS Saw revenue collapse to £3m in the year to the end of June compared to last years £5.7m. The company ascribes this as being mainly due to ongoing challenges in the Company’s core market of Argentina.The loss before tax improved from £1.5m to £0.9m and the EBITDA loss fell from £1.48m to £1.2m due to expansion in India. Management was able to stabilize global revenue and margins in the second half of the financial year, despite currency depreciation in Argentina and India. Challenging trading conditions are continuing in Argentina and revenues in India have been impacted by a fall in revenue as a new competitor is awaited in the mobile market. The Board still believes that India remains the largest opportunity for the Company to deliver growth. Urban Exposure plc UEX updates that it has experienced positive trading momentum, since its admission to AIM on the 9th May. with continued growth and strong demand from developers seeking finance. However the method by which this is being executed will produce lower immediate profits than expected with significantly reduced income in the short term but strong growth in the medium term. The company published a trading update on September 6, in regard to operations at its India subsidiary Mobile Streams India Private Limited. MSIP exceeded the important milestone of reaching 50,000 active subscribers, driven by subscription growth enabled by billing connections for the three largest local mobile phone operators. The Company said it expected to add additional billing connectivity to the next three largest network operators in India before the end of the calendar year. This has the potential to increase the addressable audience from the current c.600 million mobile users to around 900 million such users. Another VectorVest metric is GPE (Growth to P/E Ratio), which compares earnings growth rate to P/E ratio. MOS.L has a GPE rating of 1.47. With long-term interest rates currently at 3.79%, the operative GPE ratio for MOS is 0.14, and therefore may be considered to be undervalued. The chart of MOS.L is shown here. The value of the share is shown by the green line above the price. Sooner or later the price and valuation will coincide. Sometimes this occurs in a linear fashion but in smaller counters the move tends to be quick, explosive and news driven. The sudden jump in price was preceded and forecast by a jump in earnings growth rate (purple line in the window below price) from zero to an excellent 23% in the first three months of this year. Since June 2016 the share has been sitting on support at 4p. The “tails” or “wicks” on the candles at that level are indicative of accumulation by insiders and those traders that have done their research. A Unisearch for undervalued shares that are showing a high rate of change in earnings growth will uncover many trading opportunities, easily, with a few mouse clicks. 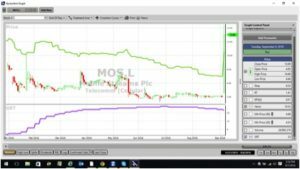 In summary, MOS.L is undervalued compared to its Price of 9.5p per share, and despite offering somewhat below average safety, is currently rated a Buy. PS: Readers can examine the opportunity at Avesco, and indeed on a host of other similar stocks for a single payment of £5.95. This gives access to the VectorVest Risk Free 5-week trial, where members enjoy unlimited access to VectorVest UK & U.S., plus VectorVest University for on-demand strategies and training. Link here to view.